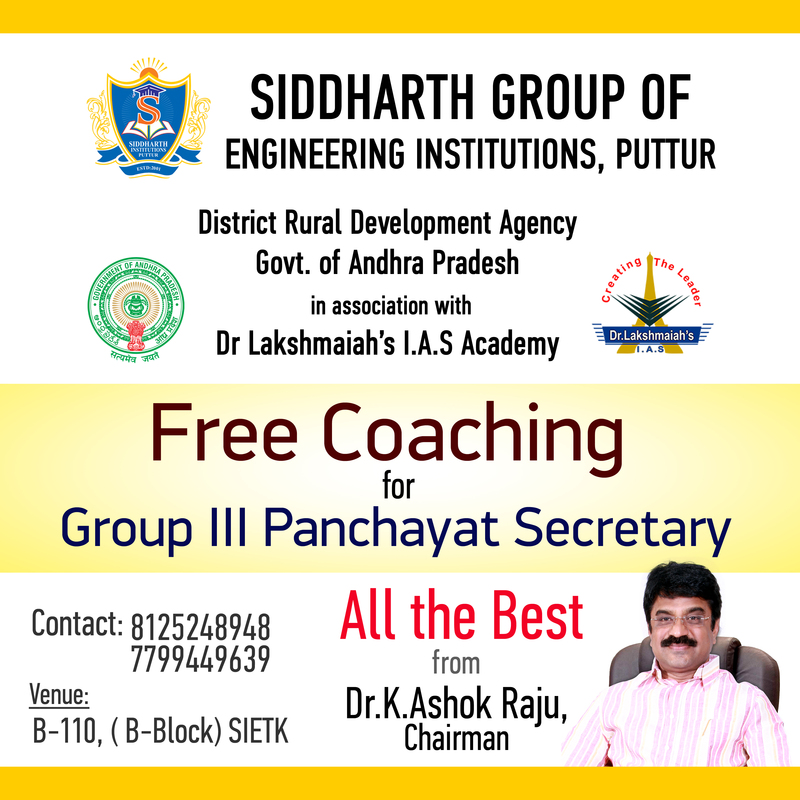 Welcome to Siddharth Institute of Engineering & Technology(SIETK). We offer the best of venerable atmosphere coupled with the intellectual and technological resources with enthusiastic fortitude to the students. The School of Engineering is uniquely positioned to educate the technological leaders of tomorrow. Our goal is to position our engineering graduates to be problem solvers, project leaders, communicators, and ethical citizens of a global community. Grounded in our commitment to engineering education innovation and interdisciplinary research, we offer our students a rich educational experience, an experience that includes intellectual rigor and student-centered environment. I invite you to become better acquainted with the School of Engineering, where you will discover not only engineering excellence, but also a campus alive with cultural, artistic, and intellectual activity. SIETK aims to shape the students as individuals capable of thinking independently, creatively and objectively. The holistic approach in teaching and learning encourages students to indulge in extra-curricular activities to shape them as Leaders of Tomorrow. Placement and Training is the strength of our College. At the end of the course, majority of the students carry home, job offers in reputed Multi-National Companies of their choice . In addition to this we organize seminars, industrial visits, paper contests, group discussions, guest lectures, career guidance etc under its auspices. The campus is characterized by cultural, racial, and gender diversity in the faculty, staff, and student body, supported by practices and programs that embody the ideals of an open and democratic society. Placement and Training is the strength of our College. At the end of the course, majority of the students carry home, job offers in reputed Multi-National Companies of their choice. Received Doctorate Degree from Prestigious University of Madras. 1988	-	Late Sri N.T.Rama Rao selected for one year training in National Institute for Political Consciousness (Jaatheeya Raajakeeya Pariznana Parishat). -	All round First in the Institute. for Information & Public Relations. 1989 Nov.- Appointed as Election in-charge for West Godawari District. 1990 June - Appointed as Private Secretary to the General Secretary Mr. Chandrababu Naidu. 2000	-	In the year 2000 started HPCL out let at Srikalahasthi – Tirupathi High Way. 2005	-	In the year 2005 started MBA & MCA courses at Siddharth Institute of Engineering & Technology. -	At 2009 started M.Tech. 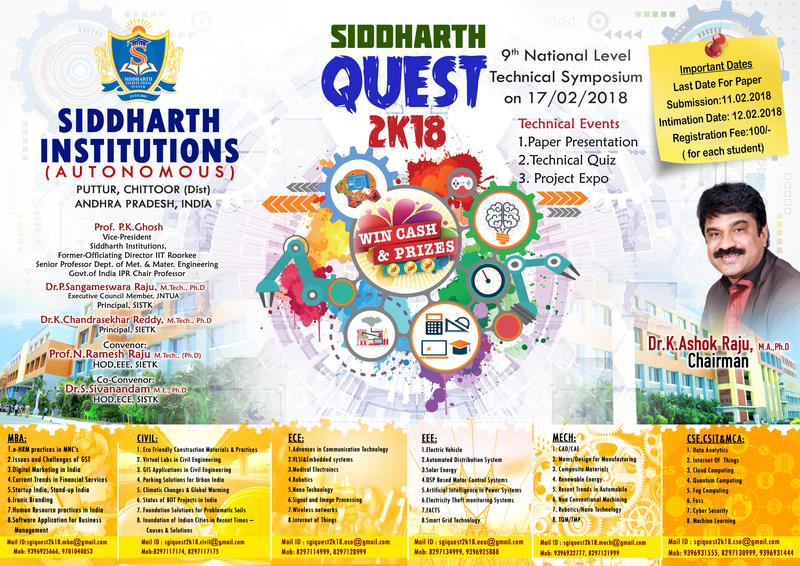 Courses at Siddharth Institute of Engineering & Technology. 2009	-	Completed Ph.D. in the year 2009. Received Doctorate on 19th January, 2010 at Centenary Auditorium at Madras University by the Governor and Chancellor Mr. Surjith Singh Barnala. Running Educational Institutions and running other Businesses. The Chairman of the Board, Dr. Ashok Raju Konduru, an educationist and philanthropist, spearheaded the Siddharth Group of Engineering Institutions to become emerging centres for excellence in Engineering and Management education in a matter of 15 years. His commitment and determination to make Engineering and Management education available to the rural students around Puttur town reflects in the phenomenal growth of student strength in the last 15 years. His dedication to quality infrastructure and education reflects in the accreditation of three courses (SIETK) by National Board of Accreditations (NBA), New Delhi and achieved NAAC “A” Grade. A strong believer of collaboration and cooperation, Dr. Ashok Raju has played a key role in associating with VIT University and Jawahar Knowledge Center, IEG, Government of A.P. for Training and Placements of the students of his institutions. A recipient of “Educationist of the Year Award – 2008” from the WES, New Delhi, Dr. Ashok Raju aims at preparing the student community to meet Global industry needs and played a vital role in signing an MOU with University of Massachusetts Lowell, USA that enables exchange of students and faculty between the two institutions, joint projects, research, etc. He has played a pivotal role in bringing the chapters of “A.P. State Skill Development Corporation” and “Startup Incubation Center” to the institutions which benefit the students immensely. With his immeasurable achievements and untiring efforts to make a difference in the lives of the students, Dr. Ashok Raju has emerged as an iconic personality among thousands of young engineers as well as education circles in the state of Andhra Pradesh and the neighboring states. Recognized by AICTE, New Delhi. Got AUTONOMOUS status in 2016. 5 UG – B.Tech.programmes (ECE, ME,CSE, Civil and EEE) were accredited by NBA in 2017. 2 New B.Tech courses Agricultural Engineering and CS&IT approved in 2017. Permanently affiliated to JNTUA, Ananthapuramu. Recognized by AP State Government as ‘A’ grade institution (14 out of 119 under JNTUA). 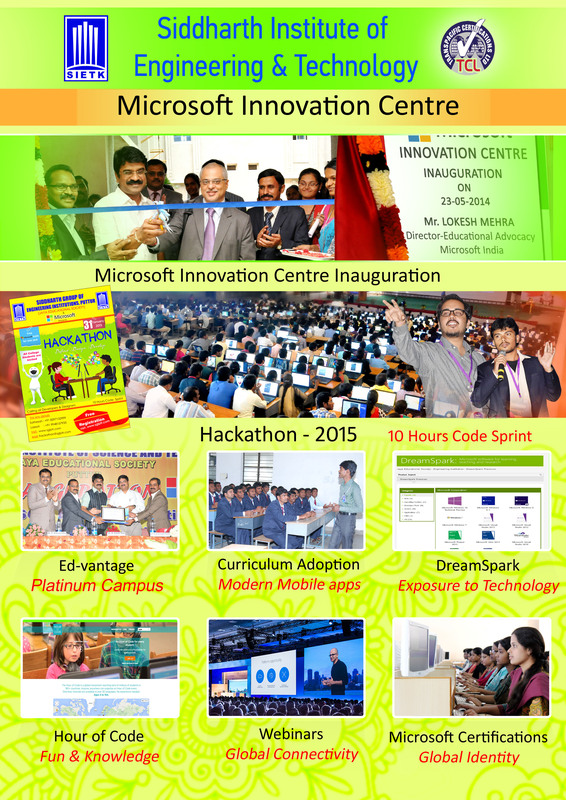 Microsoft Ed-vantage Platinum with Innovation Centre. Member of Jawahar Knowledge Centre of A.P. State Government with Star Status. SIEMENS T-SDI Sanctioned by APSSDC,A.P.State Govt. 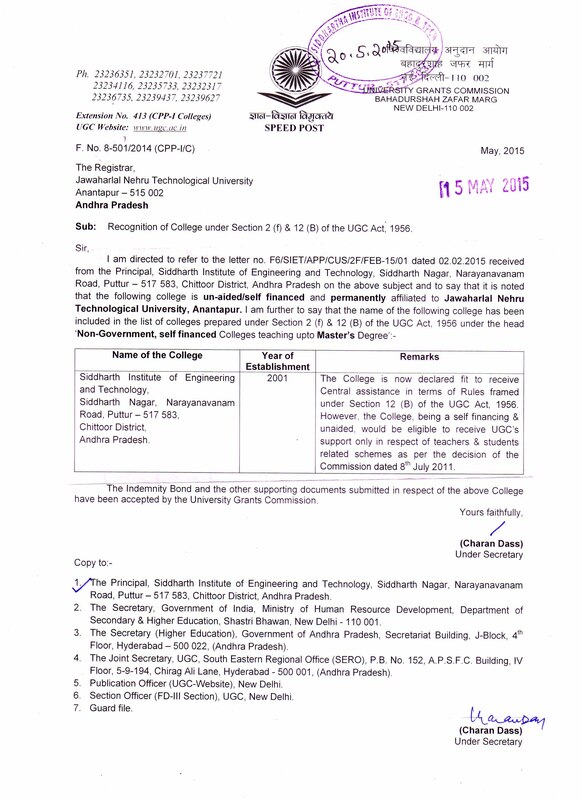 Skill Development Centre(SDC) sanctioned by Andhra Pradesh State Government. MoU with Massachussets University Lowels,USA. A/C Video Coach busses on concept of "KNOWLEDGE ON WHEELS"
Centralized AC Computer laboratories with High COnfigured Systems. A functional status given to the Institutions, by the University Grants Commission (UGC) by giving greater flexibility towards purely academic development for up-liftment of academic standards and excellence. An Autonomous Institution carries a prestigious image for the students and the faculty members. Faculty Recruitment Notification for CE,ME,EEE,ECE,CSE,MBA,MCA,BSH,TAP,AGRICULTURE and also Other Positions. Click here to Submit Online Application on or before 10th April 2019. Alumni Meet "SFAA Home Coming 2K18" on 30th December, 2018 at college campus. Two Days Workshop on Advanced Materials for Safety and Reliability of Automobiles in Indian Conditions - March 8th & 9th, 2018. "One of the institutions of the group has received NBA accreditation for FIVE programmes in 2017. The institutions are embarking on a voyage to have all the programmes accredited by NBA"
"A hub of world-class resources and supports for students, entrepreneurs and startups. 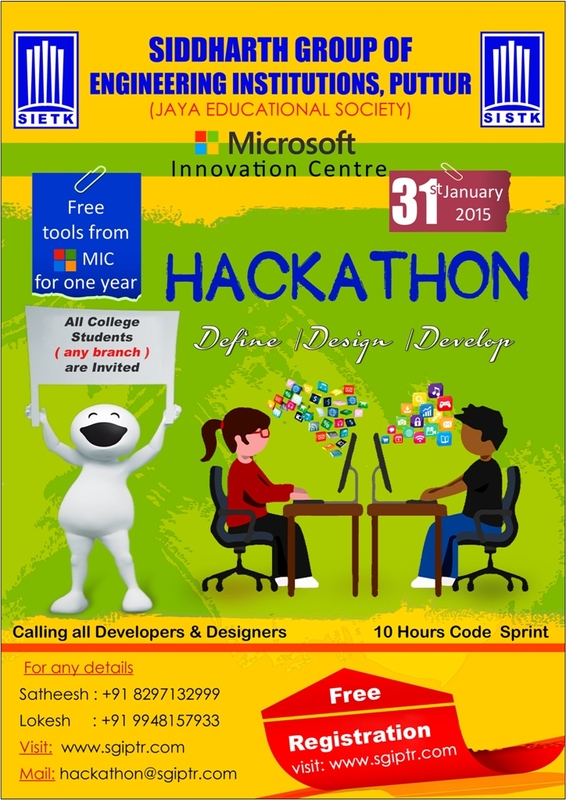 Now, SIETK is a place for Microsoft Innovation Centre to learn new technology things in the real-world." 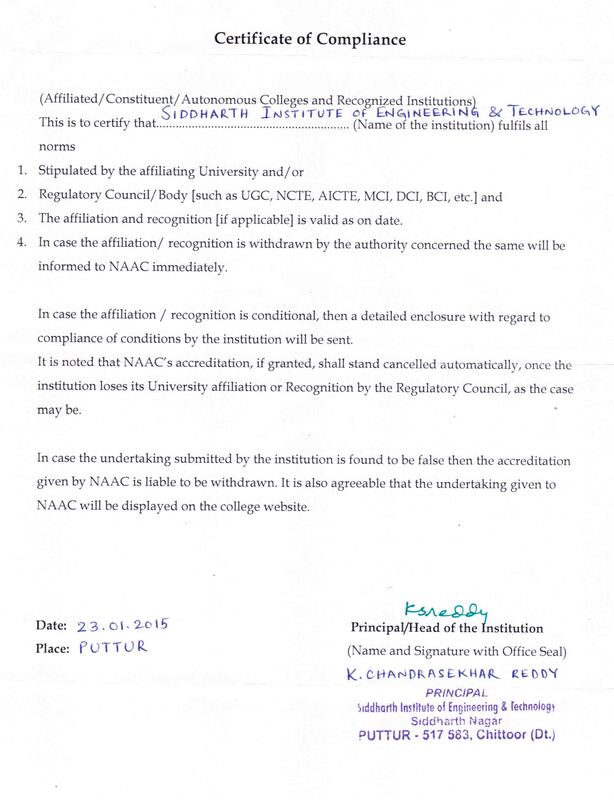 "One of the institutions of the group has received NAAC accreditation with "A" Grade. The institutions are embarking on a voyage to have all the programmes accredited by NAAC"
" JNTUA - Permanent Affiliation from the Academic Year 2016-17." "'14 Prathibha' awards by A.P State Government in 2015 from Hon'ble Chief Minister Sri. Nara Chandra Babu Naidu Garu." "Received University Gold Medals from Honarable Vice Chancellor in 2014." "90% of the students were placed in different IT companies in the year 2015. we heartly congratulate to all the selected students."